After the wedding, I had one last day in Munich before hopping an overnight train to Paris.. I, of course, chose to spend this rainy and chilly day, doing what you're supposed to do when you have one day in Bavaria - eat lots of food, and drink lots of beer. Heeeeelll yea. 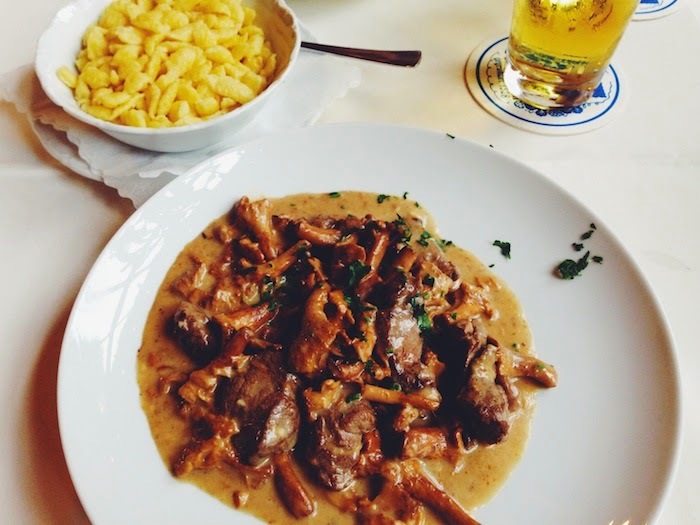 A Jägerschnitzel is a pork dish served with lots of gravy and mushrooms, and with a side of Eierspätzle, which is the weird middle brother of a dumpling and a noodle, and tastes like you died and went to cholesterol heaven. Of course this meal was served with my third pint of Weißbier (light German beer) - naturally. I will try to come up with a little intro-recipe for a similar dish, as following the actual traditional way of cooking it will be near impossible with all the ingredients missing, but I promise it will be just as delish. This, ladies and gents, is why I feel at home in Germany.. This and the endless supply of beers obviously. Mahlzeit!